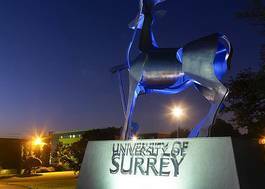 Study Electronic Engineering with Space Systems at University of Surrey - Which? Overall: AAB - ABB We do not include General Studies or Critical Thinking in our offers. Required Subjects: Mathematics and one of: Physics, Electronics, Computing, Computer Science, Further Mathematics, Design and Technology: Systems and Control Technology. Applicants taking the Science Practical Endorsement are required to pass. GCSE or Equivalent: GCSE English Language at Grade C(4) and Mathematics at Grade C(4). Overall: QAA-recognised Access to Higher Education Diploma with 45 Level 3 Credits including between: 39 at Distinction and 6 at Merit - 30 at Distinction and 15 at Merit Required Subjects: Modules must be in relevant subjects. GCSE Equivalent: GCSE English Language at Grade C(4) and Mathematics at Grade C(4). GCSE or Equivalent: GCSE English Language at Grade C(4) and Mathematics at Grade C(4). Overall: DDD BTEC Extended Diploma, and A-Level Mathematics at grade B. Required Subjects: BTEC must be in a relevant subject GCSE or Equivalent: GCSE English Language at Grade C(4) and Mathematics at Grade C(4). Overall: Pass overall with AAB - ABB from a combination of the Advanced Skills Challenge Certificate and two A-levels. Applicants taking the Science Practical Endorsement are required to pass. Required Subjects: A level Mathematics and one of: Further Mathematics, Physics, Electronics, Computing, Computer Science. GCSE or Equivalent: Completion of GCSE English and Mathematics equivalents within the Advanced Skills Challenge Certificate. 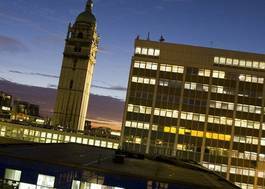 Our programmes cover the core theory, along with the latest developments in hardware and device electronics, electrical power generation, advanced nanotechnologies, software and computer systems, satellite engineering, mobile communication and multimedia engineering. We focus on applying theory to real engineering problems and technologies, combining training in professional engineering skills with scientific research methods. Our professional development modules cover product design and implementation, preparing you to work as a professional engineer. Individual and group projects during the degree will also give you a chance to work with academics from our research centres, helping you develop skills in specialist areas.